Home B Burdock: What Is Burdock? The prickly heads of these plants (burrs) are noted for easily catching on to fur and clothing (being the inspiration for Velcro), thus providing an excellent mechanism for seed dispersal. Burrs cause local irritation and can possibly cause intestinal hairballs in pets. However, most animals avoid ingesting these plants. The green, above-ground portions may cause contact dermatitis in humans due to the lactones the plant produces. The taproot of young burdock plants can be harvested and eaten as a root vegetable. While generally out of favor in modern European cuisine, it remains popular in Asia. The roots and seeds are used in herbal medicine. The root is available fresh in markets, cut and sifted in herb shops, and in many tincture, capsule, or tablet products. The seed is sold in herb shops that carry Chinese herbs and is found in tinctures, capsules, or tablets. Burdock is a blood purifier that you can use for skin problems such as acne, eczema, and psoriasis, especially the seeds. Herbalists universally recommend the root (called gobo in Japan) to help ease liver congestion and difficulty in digesting fats. Use the root or the seeds for rheumatism and arthritis and the root as a protectant against cancer. 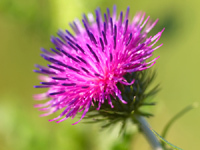 Burdock is used to promote kidney function and works through the kidneys to help clear the blood of harmful acids. It is also used for skin disorders such as carbuncles and boils, and relieves gout and menopausal problems. It aids elimination of excess fluid, uric acid, and toxins; and it has antibacterial and antifungal properties.